This photo is a happy accident. I was photographing the ship (with its strange name) and didn’t realize the light mist had gotten onto the filter over my lens, causing these little circles as the water drops caught the ship’s lights. Upon making this discovery, I was disappointed for about two seconds until I realized the light circles lifted the photo from merely good to pretty darn great (in my humble opinion 🙂 ). 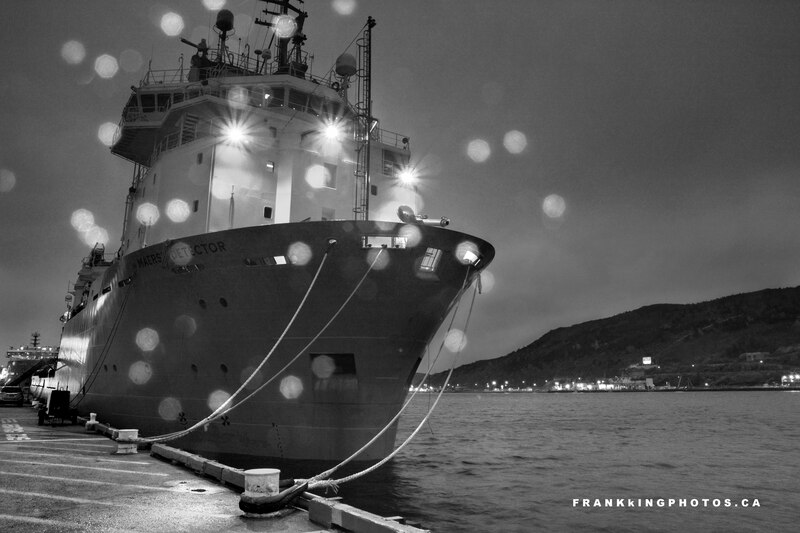 You can see this scene in colour here: http://bit.ly/MaerskDetector. Nikon D7100, tripod, graduated density (darkening) filter on the sky and the top half of the boat. One of the many beauties of photography are the “happy accidents,” and this sparkly work of art is a great example. Lovely photograph, Frank.